Office, Retail, and Hotel Development—Approximately 922,850 square feet of Class "A" office and plaza-level restaurant / retail space in three mid-rise towers, along with a full-service hotel. 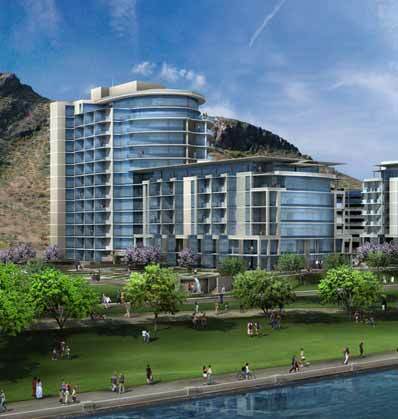 Bridgeview at Hayden Ferry Lakeside combines the excitement and convenience of urban living with the quiet serenity of lake and mountain vistas. Bridgeview has 104 luxury condominiums in a 12 story tower, offering 1-, 2-, and 3-bedroom units, each with a private patio or balcony. 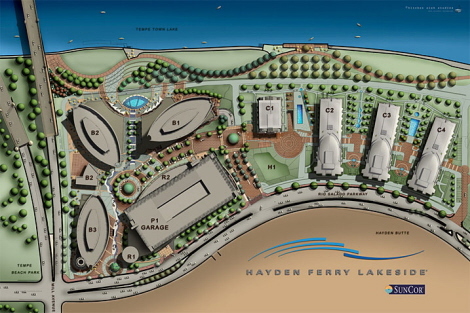 Residents will have access to a heated pool, spa and on-site fitness center. For more information or to schedule an appointment to visit Bridgeview, please contact us at bridgeview@WeAreAZRealEstate.com. 1168 - 4924 Sq. Ft. Amenities include heated pool and spa, fitness center with steam and showers, lounge, library, supper club, demonstration kitchen, Theatre room, billiards room, business center and Zen garden. Gated underground parking.